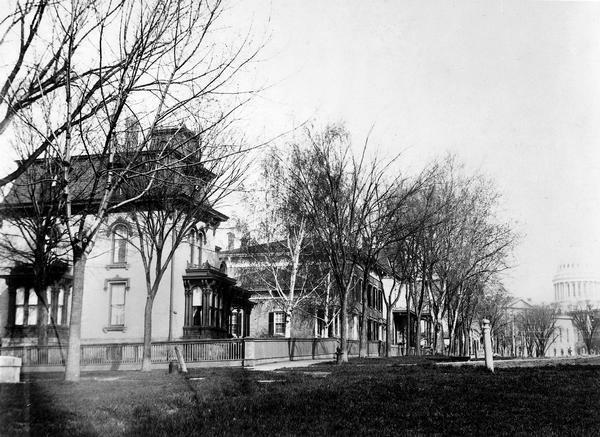 Several houses at the intersection of Wilson Street and Monona Avenue with the home of Simeon Mills, one of Madison's most prominent citizens, on the corner. Next to it is the Atwood/Buck-Neckerman house. The Wisconsin State Capitol can be seen in the background. Monona Avenue was previously South Wisconsin Avenue, changing street names on December 1, 1877; it then became Martin Luther King Jr. Boulevard on January 19, 1987.